Description: Colin Farrell and Academy Award nominee Ralph Fiennes star in this edgy action-packed comedy filled with thrilling chases spectacular shoot-outs and an explosive ending you won't want to miss! 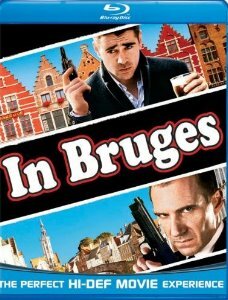 Hit men Ray (Farrell) and Ken (Brendan Gleeson Harry Potter) have been ordered to cool their heels in the storybook city of Bruges (it's in Belgium) after finishing a big job. But since hit men make the worst tourists they soon find themselves in a life-and-death struggle of comic proportions against one very angry crime boss (Fiennes)! Get ready for the outrageous and unpredictable fun you will have In Bruges the movie critics are calling "wildly entertaining". 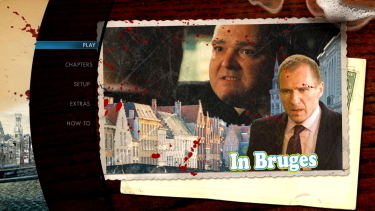 You may know that Bruges, Belgium, is pronounced "broozh," but I didn't, and the heroes of "In Bruges" certainly don't. They're Dublin hit- men, sent there by their boss for two weeks after a hit goes very wrong. One is a young hothead who sees no reason to be anywhere but Dublin; the other, older, gentler, more curious, buys a guidebook and announces: "Bruges is the best-preserved medieval city in Belgium!" So it certainly seems. 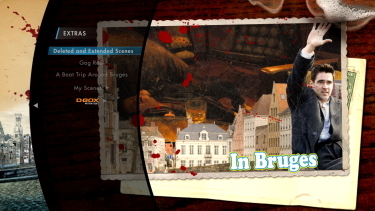 If the movie accomplished nothing else, it inspired in me an urgent desire to visit Bruges. But it accomplished a lot more than that. This film debut by the theater writer and director Martin McDonagh is an endlessly surprising, very dark, human comedy, with a plot that cannot be foreseen but only relished. Every once in a while you find a film like this, that seems to happen as it goes along, driven by the peculiarities of the characters. Brendan Gleeson, with that noble shambles of a face and the heft of a boxer gone to seed, has the key role as Ken, one of two killers for hire. His traveling companion and unwilling roommate is Ray (Colin Farrell), who successfully whacked a priest in a Dublin confessional but tragically killed a little boy in the process. Before shooting the priest, he confessed to the sin he was about to commit. After accidentally killing the boy, he reads the notes the lad made for his own confession. You don't know whether to laugh or cry. 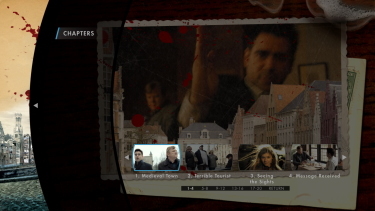 In Bruges doesn't look exceptional on Blu-ray from Universal. There have been Scandinavian, French and Australian Blu-rays of the film but I don't own any of them to compare. The image can be fairly flat at times but the dual-layered transfer has a high bitrate so the film itself may be more modest looking. There isn't much depth. Contrast is rich and inky but colors are never exuberant. Detail is not overly notable but some close-ups are impressive. It wouldn't surprise me if this Blu-ray was reasonably close to the theatrical but I would suggest people keep their visual expectations at the low end. There are some aggressive moments in the track and the DTS-HD Master 5.1 at 3918 kbps does its job well. I don't recall a lot of times where the audio really punched out of the speakers but it had some decent separation. It might be superior to the video rendering but it wasn't demo material or anything superlative. There are optional subtitles and my Momitsu has identified it as being a region FREE disc playable on Blu-ray machines worldwide. Not much in the way of supplements with just shy of 20-minutes worth of deleted and extended scenes, a 6-minute gag reel that had me smiling and a short, moderately interesting boat tour of Bruges. That is it - no commentary - but you get Universal's usual My Scenes + DBox Motion Controls for Blu-ray players. The more I thought about In Bruges - after my first viewing - the more I liked it. The actors showed some solid timing in the humorous moments and the thriller aspects built well to the finale. The Blu-ray is not one of Universal's better efforts but it gave me a decent, if visually unremarkable, viewing. I had a great time with the film but those with higher-end expectations for the video may be under-whelmed. 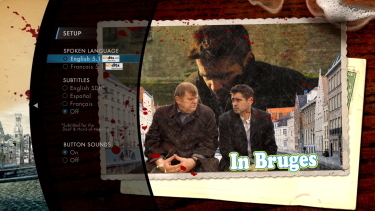 In Bruges is well worth seeing and this Blu-ray is, no doubt, the best way to view it in your home theater.